Before you could tuck it under your arm, before you could bring it up on your phone you did not read Scripture, you listened to it. For centuries, the only way to access God s Word was to hear it read aloud in public gatherings. Today, many are blessed to own personal printed copies of the Bible but there is a surprising benefit to hearing the Scriptures read aloud as it was for so many generations. 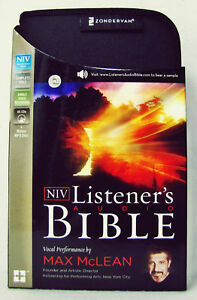 Verses you have read many times will impact you in a new way when you hear them through the NIV Listener s Audio Bible. Read in a single voice with subtle background music, Max McLean s skillful, engaging, but never over-dramatized style will bring God s Word to life during your personal and family devotion times, group Bible study, or during your weekday commute. Listen to just 13 minutes a day and you ll get through the entire Bible in a year. Or listen to 6 minutes a day to hear the New Testament twice a year. Max McLean s skillful narration will help you understand, memorize, and enjoy God s Word. "These are the most engaging recordings of the Bible I have ever heard. Hank Hanegraaff, The Bible Answer Man President, Christian Research Institute "He sounds as you might expect the writers of the text to soundif they were speaking instead of writing... McLean reads the Bible like it is the Word of God." Donald Whitney Professor of Biblical Spirituality, The Southern Baptist Theological Seminary"
recieved in time and in good shape. Product was as advertised. Remarkable reading style. Keeps my attention. I love the Bible so it is a good fit. Excellent way to learn the Bible.